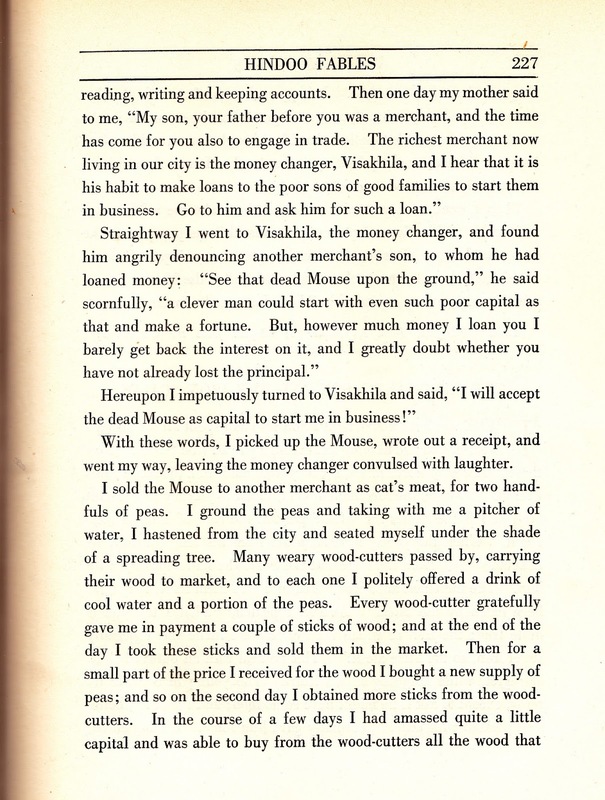 An Argosy of Fables, selected and edited by Frederic Taber Cooper, continues its journey with "Book Two, Oriental Fables." Cooper's antique spelling of "Hindoo" makes me wonder how many of the 20th century spellings that have changed their transliteration will look outdated or quaint to future readers? 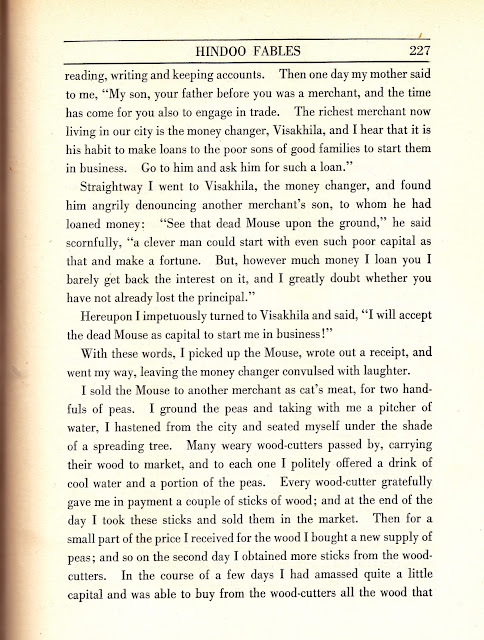 Book Two has four parts: Part I - "Hindoo" Fables; Part II - Persian Fables; Part III - Chinese Fables; Part IV - Armenian and Turkish Fables. 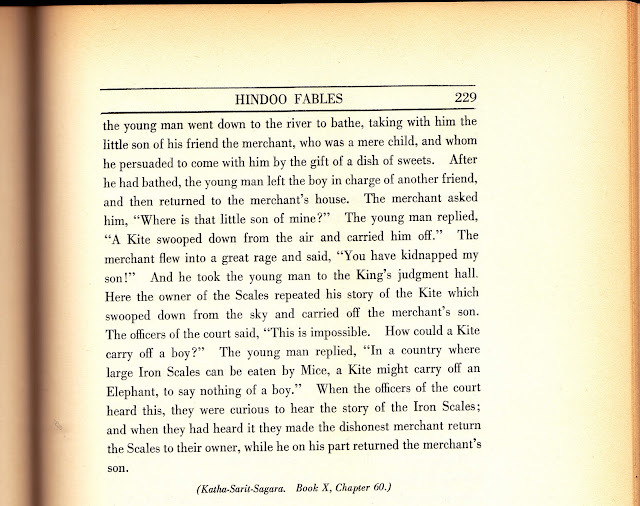 India's fables are listed by Cooper as "Hindoo" Fables because Hinduism is the dominant religious and cultural tradition for the Indian subcontinent. Don't take Cooper's Hindu designation too strictly as it includes four Jataka tales. The Jatakas are among the earliest Buddhist literature. Buddhism, in contrast to Hinduism is a relative newcomer to India and Asia. It might have been more accurate to have said Sanskrit Fables, rather than Hindu, as all stories in Part I are part of the larger body of Sanskrit literature. Seeing the Jatakas made me check back on two books I had earlier felt compelled to omit. Ellen C. Babbitt's two volumes of the Jataka tales are indeed in Public Domain, but my editions were produced later. I now have access to those original editions and will sidestep alphabetical arrangement right after finishing the Argosy of Fables. Because of that I'll skip Cooper's Jatakas. 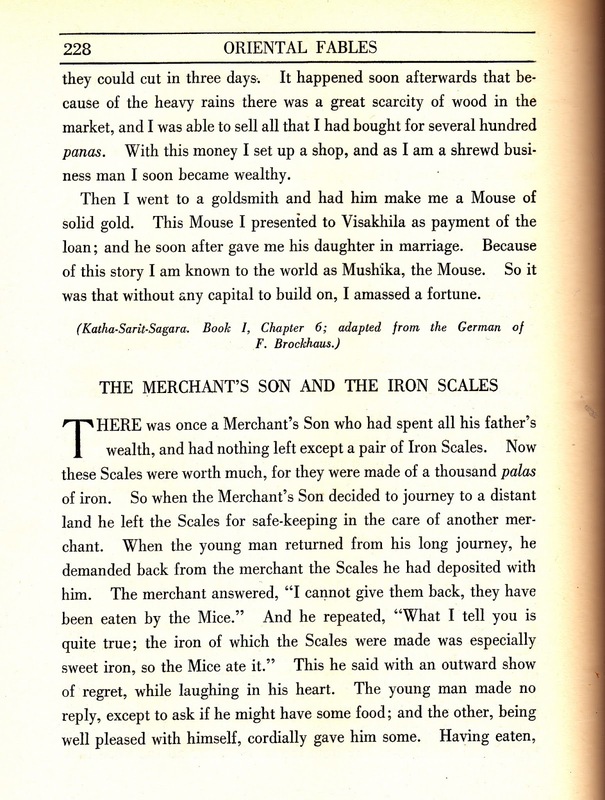 Part I has fables from Hitopadesha which is a collection with many fables in common with the Panchatantra and that is another, almost as large, group of Indian fables. Besides the Jatakas, Katha-Sarit-Sagara rounds out Part I. When I learned Kathasaritsagara was The Ocean of Story, a collection I've only seen in bits and that it was 18 books of legends, fairy tales, folk tales, and fables composed for the entertainment of the queen of Kashmir, I looked forward to dipping myself again in that ocean, but now understood why I'd never found a copy or copies of it. The Wikipedia article talks about translations and at first I thought they would barely glimpse what the queen saw. Not so! The Internet Archive has the ten volume version of C.H. 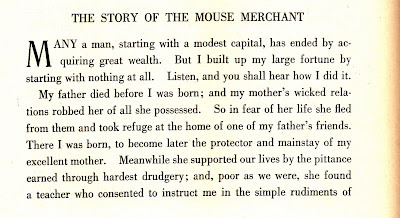 Tawney's translation of The Ocean of Story. Here are some tips: each volume starts with a lengthy Foreward; many stories just have names of the characters for titles; volume 5 has the Panchatantra; and volume 10 includes the index to the complete work, plus alphabetical lists of the stories, the motifs, and the Jatakas. 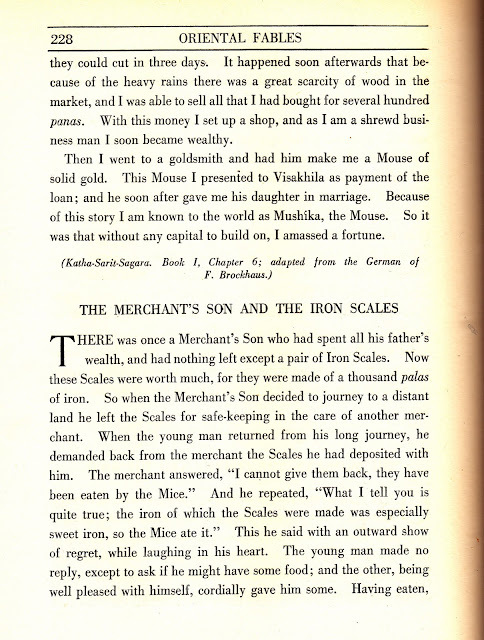 Several of those stories included in An Argosy of Fables remind me of stories told in various European traditions. Stories do travel you know, even from an Ocean of Story which pre-date Grimm and Celtic literature and . . . well, you get the idea. 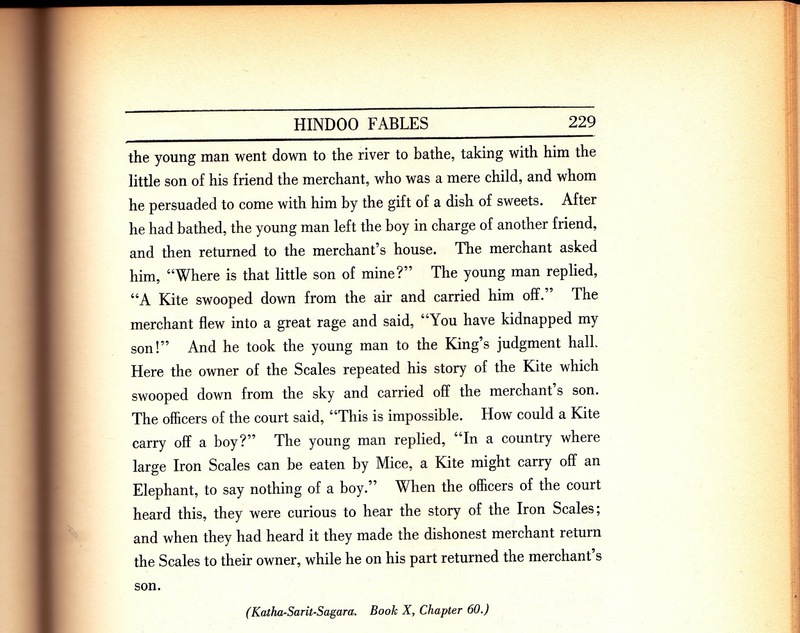 With such a large source, I'm starting here with just the "Hindoo Fables" and will save the other parts of Book Two, Oriental Fables for future posts here. 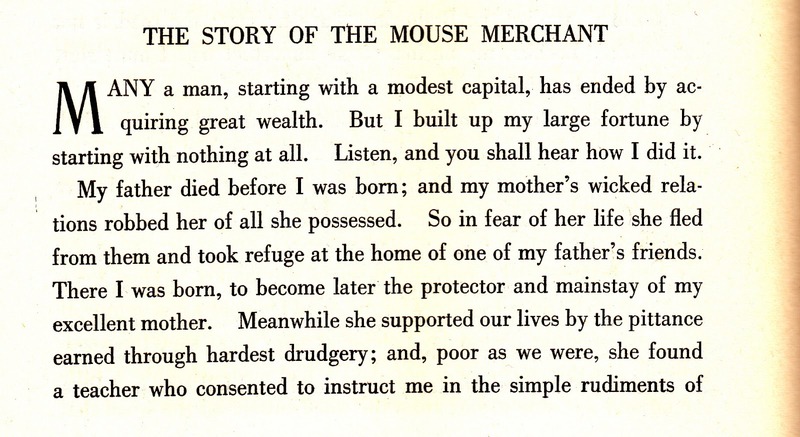 My selection here are two business-related fables from the "Ocean." I'm uncertain what translation Cooper used, but they are similar to Tawney's translation. Cooper was wrong, however, the second story is in volume 5, not 10.